My name is Fran Lavendel. 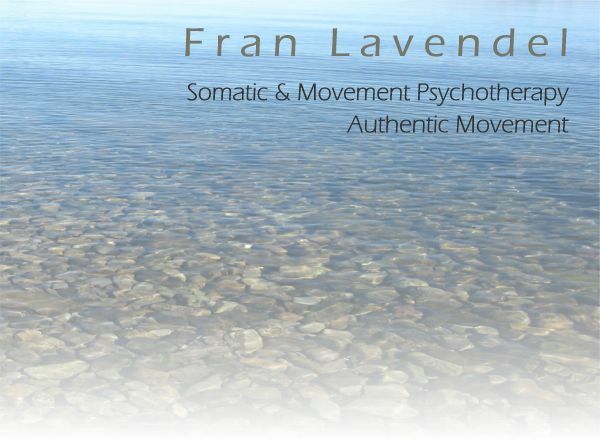 I work as a somatic psychotherapist and as a teacher of the Discipline of Authentic Movement, with a passionate interest in listening to our bodies, as well as to our words. In our bodies, after all, live all our stories, all our feelings, all our experiences of a lifetime. It is sometimes not enough to speak about problems. Listening to our bodies, maybe letting them move, can be a way to come closer to feelings, enabling us to bring them ‘into the light’. And so often, by listening to our bodies, we can actually find the healing we need, by experiencing all parts of ourselves as a whole, by re-discovering the ‘knowing in our bones’. In individual psychotherapy sessions we speak together, we pay attention to how your body is feeling and sometimes we invite movement. When it feels right to do so, we use the practice of authentic movement as a way of coming closer to really meeting yourself and as a way of feeling seen, just as you are. Indeed, the practice of authentic movement informs all my work, including psychotherapy, even when we are not working within the form of the practice. My essay entitled Healing into wholeness: Psychotherapy practice informed by the Discipline of Authentic Movement is available on this website. Some people are clear that they wish to study with me, not to undertake personal therapy. As a teacher of the Discipline of Authentic Movement I introduce people to this practice (individually and in small groups) in which we experience life directly, moment by moment, in movement and stillness, through listening to our bodies. In Somatic Psychotherapy we share experience through language while also including the body as a rich resource for information. As we listen to embodied feelings, share them with the therapist, perhaps also allow any impulses to move in any way that feels intuitively ‘right’, we meet ourselves in new places, bring shadowy corners to light, experience new possibilities of being. Personal therapy or student of the Discipline of Authentic Movement? We distinguish between the undertaking of personal therapy with me or engaging as a student interested in exploring the authentic movement practice. The difference is not always clear, as both involve deep inner work and both involve the relationship with a compassionate, accepting ‘other’. People do not always know what form of work with me they wish. We meet, we speak together, we learn together what feels right for each person. Not-knowing is always a good place to begin. All content copyright © Fran Lavendel, Photos Adam MacLean and Isabel Nicholson.